Please join the Human Rights Law Society and the Rapoport Center for Human Rights and Justice for a luncheon with Grassroots Leadership on Thursday, April 18, from 11:30 am to 1 pm. Lunch will be provided, so please register below. Attendees will have the opportunity to learn about Grassroots Leadership’s work fighting for decarceration, including in the context of immigration detention. Attending from Grassroots Leadership will be: Bob Libal, Executive Director; Claudia Muñoz, Director of Immigration Programs; and Annette Price, Texas Advocates for Justice Statewide Director. Barbara Hines, Co-Chair of the Board of Directors and the founder of the Immigration Clinic at Texas Law, will moderate the discussion. Grassroots Leadership is an Austin-based organization that “works for a more just society where prison profiteering, mass incarceration, deportation and criminalization are things of the past.” The organization’s activism focuses mostly on criminal justice reform and immigration issues. 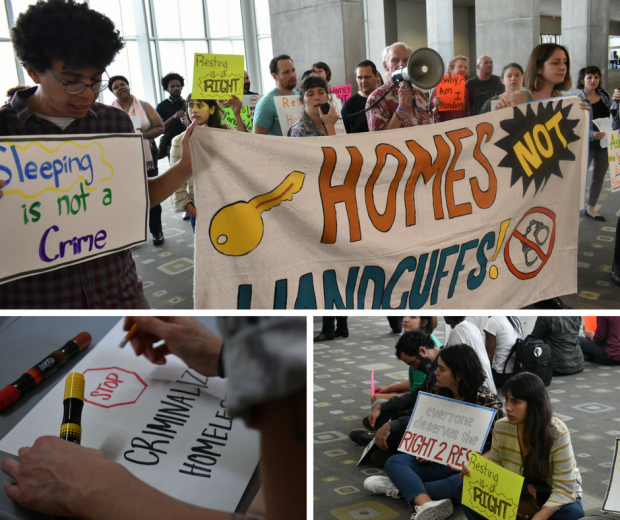 Their recent decarceration organizing has included protests at immigration detention centers in Texas, and rallies denouncing policies such as Austin’s criminalization of the homeless and local police work with ICE. To read more about Grassroots Leadership, please visit their website. Barbara Hines is Co-Chair of the Board of Directors of Grassroots Leadership. She founded the Immigration Clinic at Texas Law and is currently and Adjunct Professor at the law school. Barbara’s primary focus is on immigration. She has litigated issues relating to the constitutional and statutory rights of immigrants in federal and immigration courts, including recent work on the lawsuit that led to the closure of the Hutto immigrant family detention center. She has received numerous awards, including the 2015 National Women’s Political Caucus Women of Courage Award and the 2010 National Lawyers Guild Carol King Award, and in 2000, she was named one of the 100 best lawyers in the state by Texas Lawyer. Barbara received a B.A. with honors in Latin American Studies from the University of Texas at Austin, and she attended both the University of Texas School of Law and Northeastern University School of Law, where she received her J.D. Bob Libal is Executive Director of Grassroots Leadership, based in Austin. His work has centered on decarceration issues, including prison privatization, immigration detention, and criminal justice reform. He has written numerous reports and articles for Grassroots Leadership, including Operation Streamline: Costs and Consequences and The Dirty Thirty: Nothing to Celebrate About 30 Years of Corrections Corporation of America. In 2017, he was named one of the people changing the nonprofit world by The Chronicle of Philanthropy. He is a 2003 graduate of the University of Texas at Austin. Claudia Muñoz is Director of Immigration Programs at Grassroots Leadership. Born and raised in Monterrey, Mexico, she has lived in Texas since 2001. She began to organize with other undocumented youth after her nephew was detained by ICE, and helped to secure his release. She has worked for various labor and immigrant rights organizations throughout the country since 2009. She is a graduate of Prairie View A&M University. Annette Price is Statewide Director for Grassroots Leadership’s Texas Advocates for Justice. Born and raised in South Bend, Indiana, Price moved to Texas in 2007. She was released from the Illinois Department of Corrections in 2005 after serving 20 years, and in 2008, she was granted an early release from parole. She has been involved with reentry programs in Travis County since 2016, and she participated in writing a housing guide for apartment managers in 2018. She holds a double masters in Professional Counseling and Substance Abuse Counseling from Grand Canyon University. This event is free and open to the public. Register below!